Xosphere is well up to Sample Logic's usual high standards, making all manner of evocative noises, from delicate and beautiful to ground-shaking and terrifying. Lots of animation options. Large sample library. Excellent sound quality. A 5GB soundbank powers this remarkable Kontakt instrument, designed for the creation of soundscapes and atmopsherics. Each of Xosphere's four oscillators hosts two samples, which are mixed and morphed into each other via the Morph knobs. 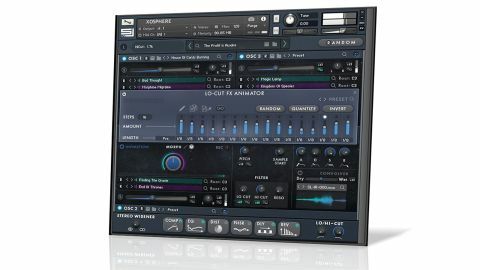 "Sound-wise, Xosphere is well up to Sample Logic's usual high standards"
These can be modulated by drawing into the Animation sequencer or recording movements in real time, and further step sequencing is available for various oscillator parameters (volume, pan, pitch, filter and convolution processor depth), as well as the six effects modules. That's a lot of motion! The sample library contains over 350 lengthy core "atmospheres", categorised by mood and type, and accessed through an in-built browser (as are the main and individual oscillator presets). Sound-wise, Xosphere is well up to Sample Logic's usual high standards, making all manner of evocative noises, from delicate and beautiful to ground-shaking and terrifying. Our only issue is the price, which feels quite high.